Toshiaki Toyoda' s film Aoi Haru (Blue Spring) reconnected me to that feeling. I have always wondered why I felt so distinctively sad when I was a teenager. I led a 'normal life': loving (though extremely busy) parents, a cool boyfriend and plenty of music to love. Yet my heart bled for all the troubles of the world. At school most sniggered behind my back at my perennially anguished mood. It was a phase in my life full of ineffable hurt which oftentimes turned into confusing anger: being in a constant state of unease was tough. Naturally, my life as a troubled teen undoubtedly proved to be as formative as my earlier wild and relatively lonesome childhood days. And frankly, I've never quite lost my teenage emotionality. In the past three decades at least, Japan too has had to deal with a serious problem concerning teen and pre-teen violence and suicides. I recently learnt about an interesting study which tries to identify the scientific reasons behind "teen angst" and the causes behind the extreme, fluctuating emotions which plague our youth. By analysing behaviours in Japan and, crucially, across ancestral human societies around the globe, it clearly emerged how natural evolution has chosen not to discard this typically adolescent trait. Furthermore, extreme teenage behaviour seems to appear in most if not all of living species. The obvious reason is that, somehow, it has been (and still is) useful, in fact fundamental, in our success as a species. How? By utilising 'reckless impulsiveness' as preservation tool in case of danger. Turns out that our ancestral adolescents were key for the survival and success of our species. Imagine the scenario: our tribe is in trouble. Water reservoirs are depleted, locusts have damaged the food resources and a hungry, more powerful neighbouring tribe is about to invade our territory. We have to migrate - fast. Who will be willing, in fact itching, to explore the dangerous, unchartered boundaries that lay beyond our familiar land? The men must stay put in order to protect women, children and the elderly. So it will be down to the fearless adolescents, eager to become fully-fledged warriors and heroes, to set out on a mission to save the entire tribe - and with that, the human gene. The success of our ancestral teens in carrying out such perilous yet crucial missions was due to the turbo-charged, almost blind, set of emotions ignited by the chemical (sexual) transformations going on in their bodies. Raging hormones made them fearless and creative, ready for action to the bitter end. Conversely, adults, tend to lose their recklessness and desire for adventure as they reach sexual maturity, becoming more 'sensible' and 'stable' so that the family can be safely looked after and nurtured. It makes a lot of sense that teen extreme emotionality has been selected by natural evolution for a fundamental purpose. The inherent intelligence of Nature is truly staggering, a trait that has long been mistaken for perfection. But of course nature is extremely fluid: genetic codes are not meant to freeze into a fixed state but, rather, to find a way to constantly improve the chances of survival through a slow, hit-and-miss process of selective, highly specific usefulness. Perfection and fixed ideas do not exist in nature, they are one of our delusions: hence emotions (the entire good and bad spectrum), sexuality, physical appearance, even genius and idiocy cannot (and should not) be defined by rules set in stone. In other words, our emotions, big, troublesome, dangerous or wonderful, are a fact of life and make us who we are. If we let them, they will make us blossom, and that's when we get to finally understand that life is a truly wondrous experience. And now a few words on the fabulous film itself. 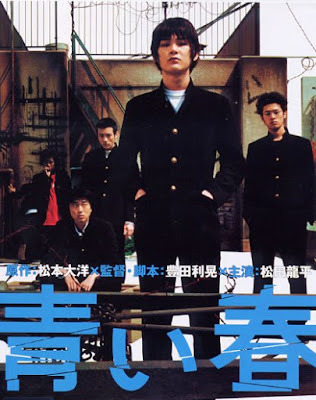 Aoi Haru (2002) is based on a manga by Tayō Matsumoto. It centres around a group of students about to graduate, but with no real desire to enter adulthood by pursuing a university degree or a career. The all-male campus school they attend has a harsh and uninspiring air of run-down concrete barracks tainted in brazen graffiti. Unsurprisingly, some of the boys respond to the desolate, hostile environment by becoming bullies and forming gangs. Sheer recklessness and bravado, violence and disrespect towards authority (teachers) determine the fragile position of the leader. Before getting into the story, let me mention how much the soundtrack contributes to the compelling viewing of this film, starting from the initial/end credits courtesy of rather oddly named Japanese indie-rock band Three Michelle Gun Elephant. The band was active throughout the nineties and broke up in 2003. Sadly I wasn't aware of them while they were active, which is a pity, as I love their raw, emotional and sexually charged sound, an edgy blend of punk, indie and dirty blues. The gorgeous theme of Aoi Haru is called "Redhead Kelly". The haunting track is featured on the penultimate album released by TMGE in 2001, Rodeo Tandem Beat Specter (they seemed to enjoy extravagant mouthfuls). The two main characters in Aoi Haru are childhood friends Kujo and Aoki. Kujo is the more introverted and meditative teen, the classic creepy nerd. 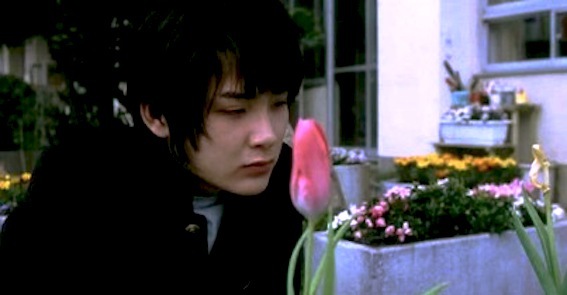 He is bewitchingly portrayed by an 18-year-old Ryuhei Matsuda (who debuted aged 15 in Gohatto -Taboo-, a film I particularly love and which I will write about in the near future) Young Kujo, blessed with a startling kind of beauty, is an intelligent and introspective boy capable of extreme acts of violence and bravery, hence he soon becomes the leader of the main school gang. Resigned to the fact that the dog-eat-dog survival policy which rules the entire school will also inevitably apply to the outside world, Kujo deals with his new position of power with ruthless detachment. His friend Aoki, who admires him, soon becomes frustrated with the insular aloofness of his 'boss' and eventually decides to challenge his leadership. Kujo though, fully aware of his superiority, shows no interest in fighting. Instead, he spends many schooling hours on his own contemplating the vast blueness of the sky from the school's roof terrace, seemingly dreaming of releasing himself from the absurdity of that senseless reality. While fatal random acts of disturbing violence are perpetrated by various peripheral characters, Aoki finally sets up his final showdown, choosing death. Kujo, whose attempt at saving him fails, finally decides to give life a chance to blossom. The young Ryuhei Matsuda plays an instrumental part in creating in Kujo a fascinating, memorable character, one the viewer cannot help putting one's trust in. Interestingly, the actor himself left school early to concentrate on his acting career, and one suspects that in his teens he might have not felt at ease within his own school environment because of his status (born into a famous acting family) and perhaps his androgynous, unsettling beauty too. 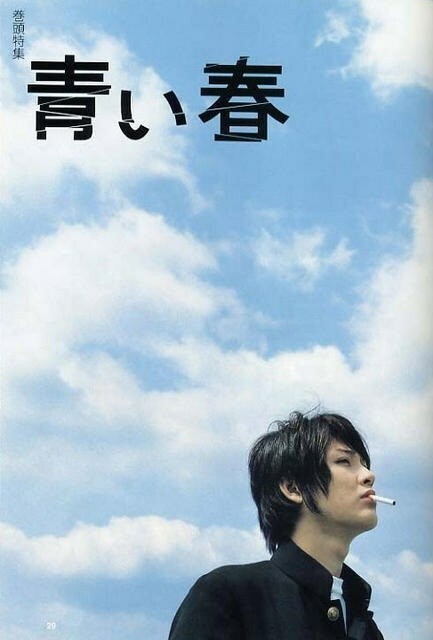 Whatever the case might be, the Ryuhei is more than convincing in a teen role where gritty self-survival and a yearning for a different future collide almost fatally. In the end, he does chose to become a tulip. Thank you Grapey for uploading the movie.